Lots of them. I would constantly look up and see them in hotels, bathrooms, and in the most random places, like this fruit stand near a popular waterfall. 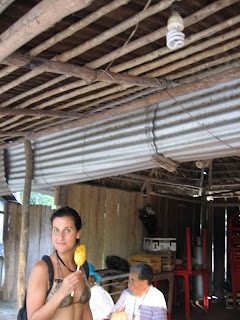 That's my traveling companera Lori eating a glorious Mexican mango. Why is CFL usage so widespread down south? Because they last longer and undoubtedly save much-needed dinero. It just makes sense! 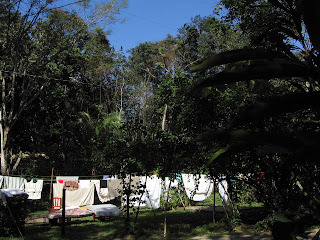 Clothes dryers are extremely rare in Mexico, as in other countries. In fact, even well off families hang-dry their clothes. It's so much fresher and adds some color to the backyard. This is a huge one. The bottles don't get recycled, they actually get REFILLED (yes, after extensive sterilization). Refilling beverage containers used to be a common practice in our country too (more on this soon), and still exists in other countries out of economic necessity. People place a deposit on the bottles at purchase, and must return the bottle to not lose the deposit. This exists in some states in the U.S., but none that I've ever lived in...Gee, when I think of fall the beer bottles, over all the years...I would feel better about my own amount of imbibing knowing they had been reused again and again, wouldn't you? I saw this all over--trash separated into "organic" and "inorganic" or paper and plastic. Presumably they compost the organic matter (food and paper), instead of sending it to a landfill. I'm going to look into this further to see what this program is all about. 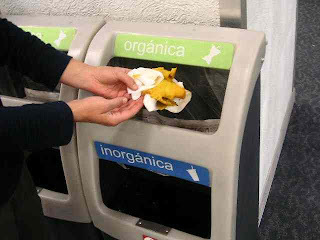 That's the remains of a mango going into the organic side of an airport trash bin. (BTW, that wasn't even my last mango before leaving the country. I actually cut one open right on my tray table before we landed in L.A. The flight attendants thought I was a crazy person). 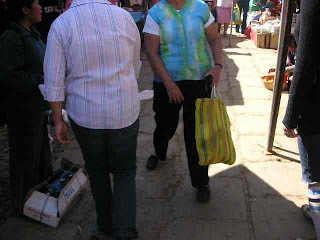 Perhaps my strongest memory of visiting Mexico as a child is of women carrying their colorful bolsas at the markets. And while I did notice a plastic ubiquity encroaching on the country this time, I was relieved to see that reusable bags are still alive and well. Women visit the market every morning, and fill their bolsas with some of the freshest produce in the world. 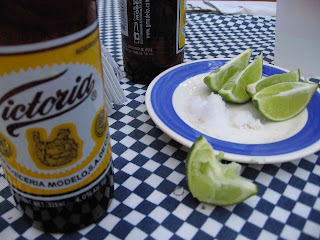 The platanitos, nopales, and yes, mangos definitely wouldn't deign to rub skin with plastic. Are any of these practices a huge inconvenience on people's lives? Would any of them catapult us back to the dark ages? I don't think so. Recently came across your video (no more plastic bags) and just now your blog....would love to chat plastic alternatives sometime, nice work! Thanks for sharing your finds! 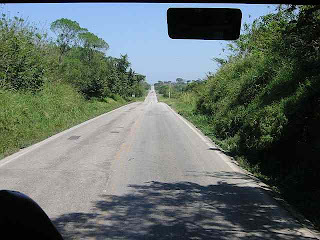 I am also dealing with my travel-lust induced guilt and am off to Central America soon. I'll definitely keep my eyes peeled for "green" ideas. BTW tupperware doggie bags - great idea!